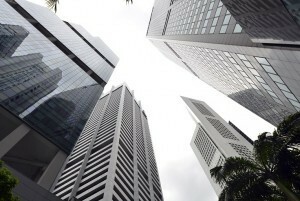 Office rents across Singapore rose by 1.6 percent quarter-on-quarter in Q2 2018, down from the 2.6 percent growth seen in the preceding quarter, according to latest data released by the Urban Redevelopment Authority (URA) on Friday (27 July). But on an annual basis, office rents increased by 9.45 percent, surpassing the 6.55 percent year-on-year gain in Q1 2018. Desmond Sim, CBRE’s research head for Singapore and Southeast Asia, said “better quality buildings showed stronger rental growth, evidenced by the 2.4 percent quarter-on-quarter increase for (median rent of) Category 1 offices while Category 2 office rose only 1.4 percent”. On a yearly basis, monthly median rent of Category 1 offices rose 11.18 percent from $8.50 psf a year ago to $9.45 psf, while that for Category 2 offices climbed 9.11 percent from $5.16 psf to $5.63 psf in Q2 2018. Island-wide vacancy also declined to 12.2 percent in the period under review compared to 12.5 percent in Q1 2018 and 12.4 percent in Q2 2017. “CBRE believes that the Singapore office market is becoming a two-tier market, with stronger focus being placed on Grade A properties. Flight to efficiency has been a key theme for occupiers, with demand being driven by select sectors such as co-working, and to lesser extent technology firms,” noted Sim. Meanwhile, rents of retail space in the city-state dropped 1.1 percent on a quarterly basis in Q2 after it edged up by 0.1 percent during the first quarter. On an annual basis, retail rents slid 1.7 percent in Q2, a slight improvement from the 1.78 percent year-on-year dip in Q1 2018. The vacancy rate also declined to 7.3 percent in the quarter under review from 7.5 percent in Q1 and 8.1 percent a year ago. “CBRE believes that despite the quarter-on-quarter corrections in the retail rental index, rentals from prime space remain resilient from the fairly tight vacancies in this category. “Orchard Road space continued to display resilience as vacancy rates inched downwards to 5.6 percent in Q2 2018, the lowest in 14 quarters,” Sim added.